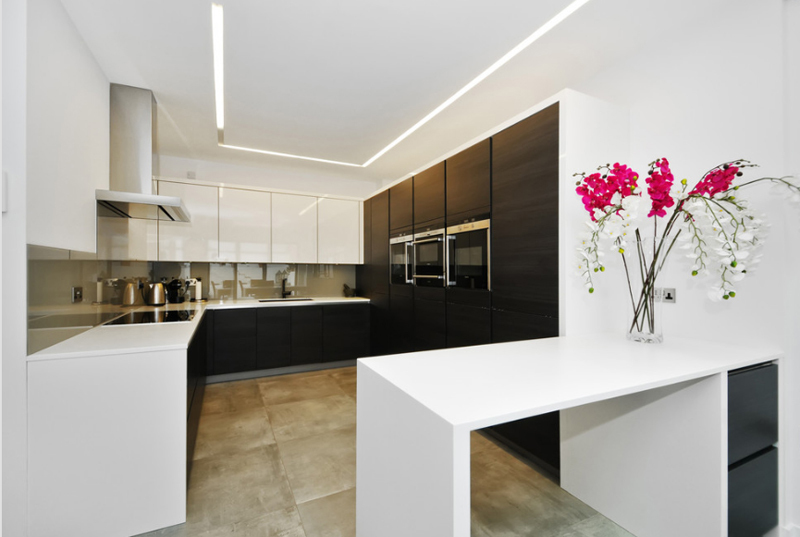 Want some L-shaped kitchen design ideas? This is the list you need. I know that this list is kind of awkward, I mean, why not do a list with twenty L-shaped kitchens instead of twenty one; but while I was trying to choose the photos and came up with twenty one and it was hard which one to actually delete – so I decided to keep all twenty one. Anyway, I think that all the kitchen photos in this list is way too neat not to notice. 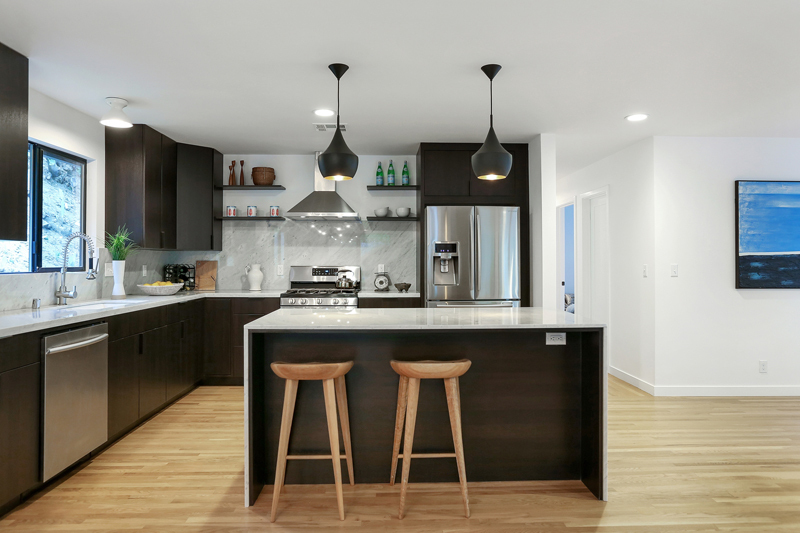 Below is a list that I was just telling you about – a list of 21 Neat Black and White L-Shaped Kitchens that has the classic look any home owner who would like to remodel their kitchen and choose the never-dying black and white combo. Check out this list and tell me what you think of them. 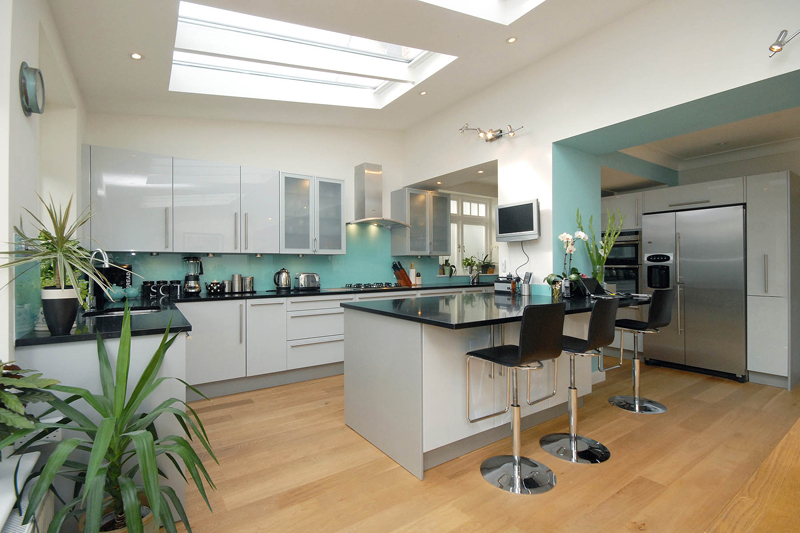 Without a counter in the middle, this L-shaped kitchen provides sufficient floor space. The colors are in sync beautifully and there are several cabinets and storage which is definitely space-saving. 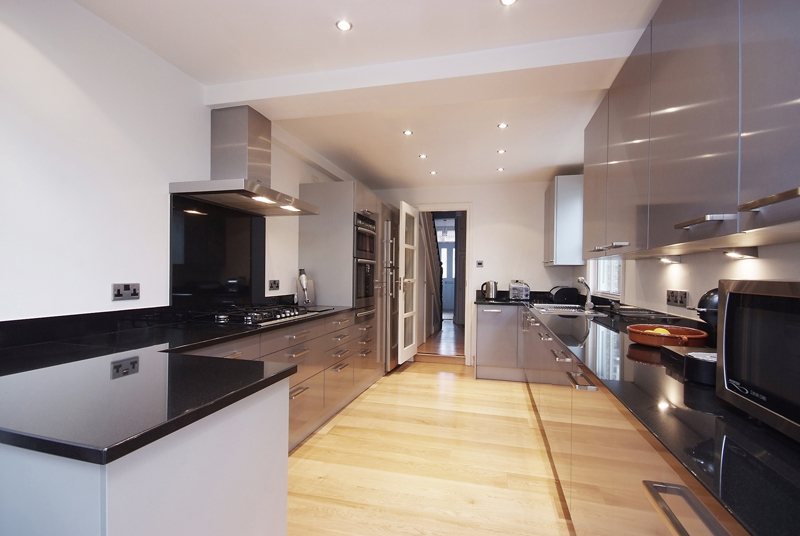 The stainless equipments add elegance to this kitchen as well. 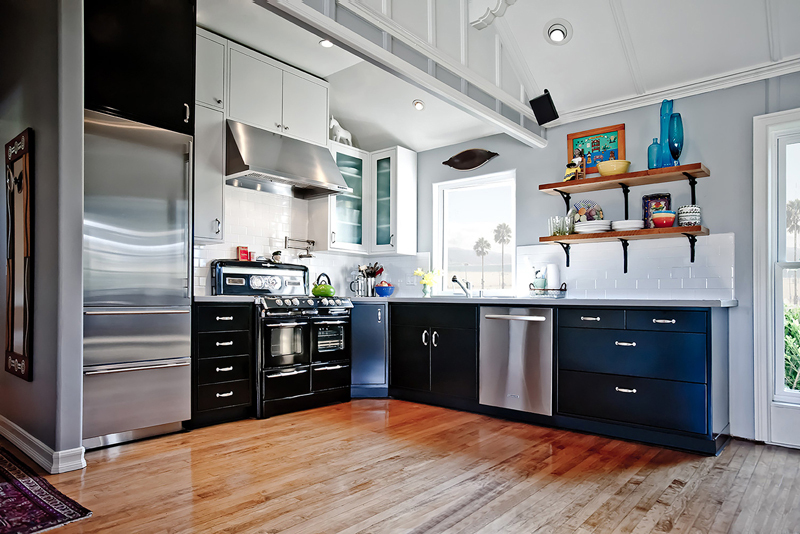 This kitchen is dominantly white but at least the countertops are black since these get the most stains and spills. 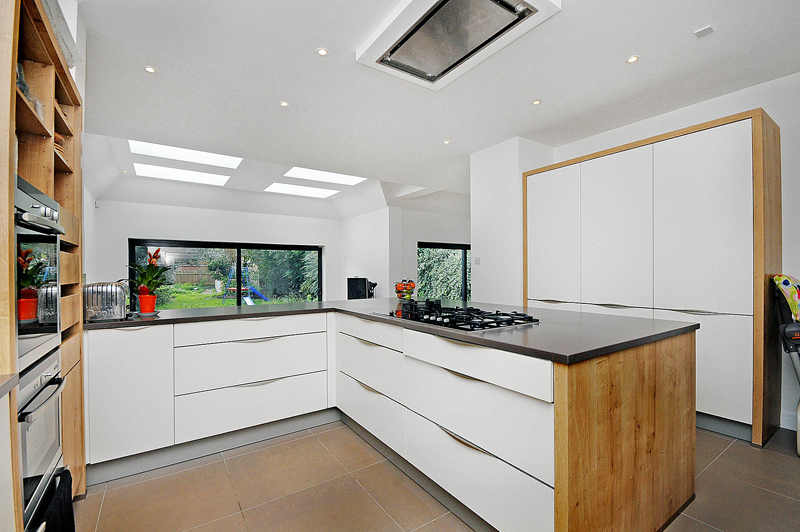 The L-shape is inward so the kitchen works alternately as a counter and these drawers look really spacious too. This is a very beautiful kitchen. 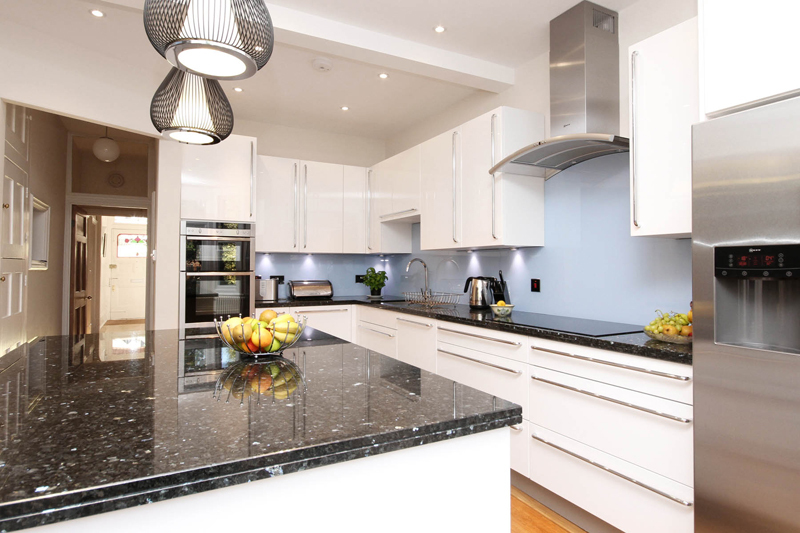 The incorporation of marble or granite into this kitchen adds a certain feel of cleanliness and adds a nice touch to the kitchen. 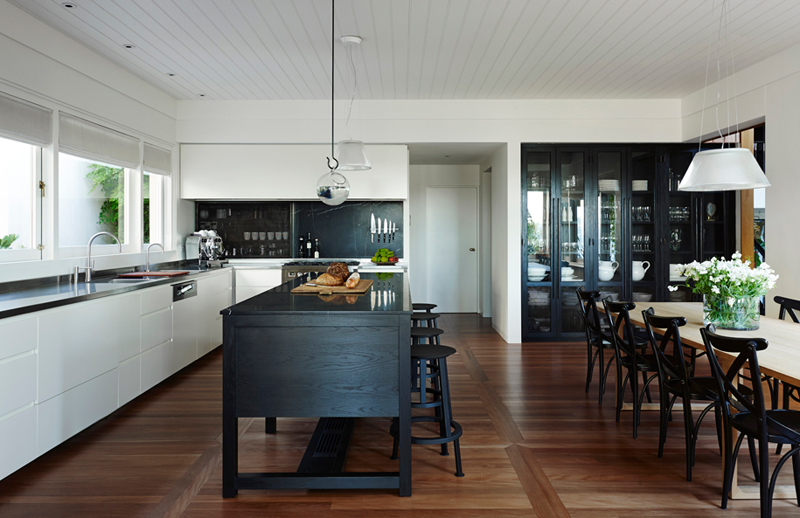 The floor adds completeness to the black-and-white motif to this whole area. A very wide kitchen that the home cook will absolutely love! 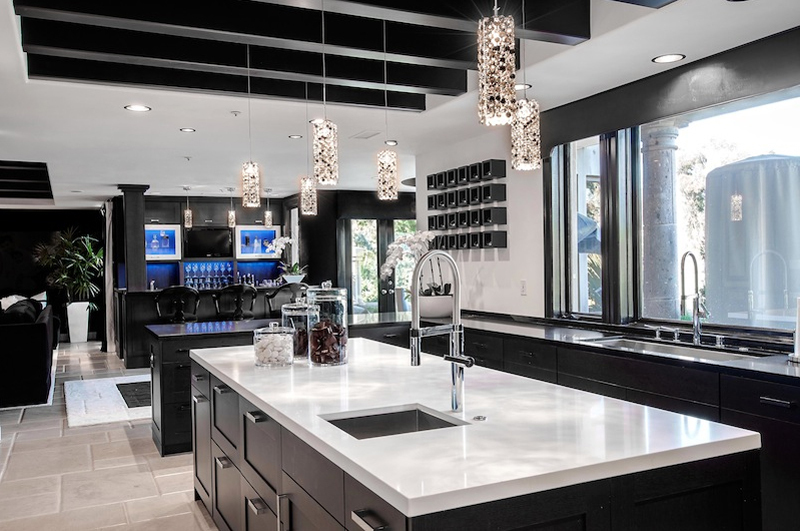 When black, white, and stainless colors are used, they complement well and create a gorgeously elegant kitchen like this one. I also adore this center counter with a pretty black pendant lamp that hangs beautifully. Here is an example of an over-the-top charming and elegant kitchen if not extravagant. 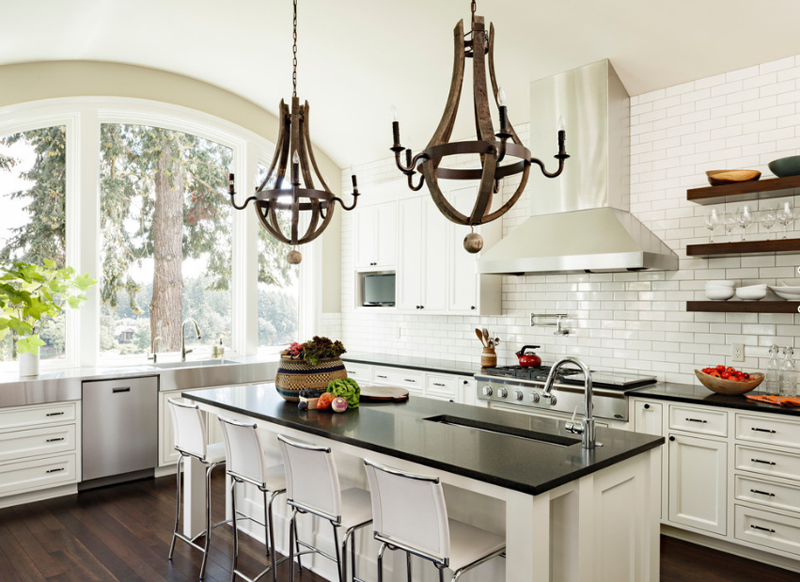 This kitchen actually reminds me of the Great Gatsby, especially with this shining, shimmering, splendid pendant lamps. The counter and the kitchen in general have several drawers making this design really practical. And at the other end is a gorgeous black bar where friends may hang out. This kitchen looks really clean and us perfect for your home and definitely perfect for the home cook. This kitchen looks simple and straightforward and perfect for families or couples who value practicality and simplicity when decorating their kitchen. This kitchen has unarguably a lot of space! Perfect for anyone who wants everything intact and wants to save time through storage keeping and advance grocery shopping. The center counter is so wide it might accommodate a lot of people who may want to hang out in the kitchen with the chef or the cool home cook. The colors in this kitchen beautifully blend together and mesh nicely. 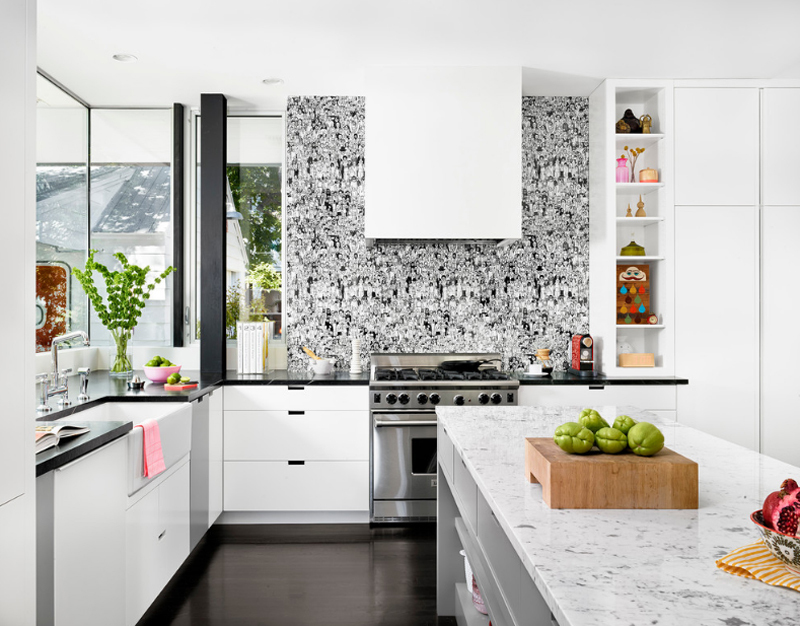 The design is clean and the decors may not be a lot but they definitely add a bit of punch to the black and white kitchen. 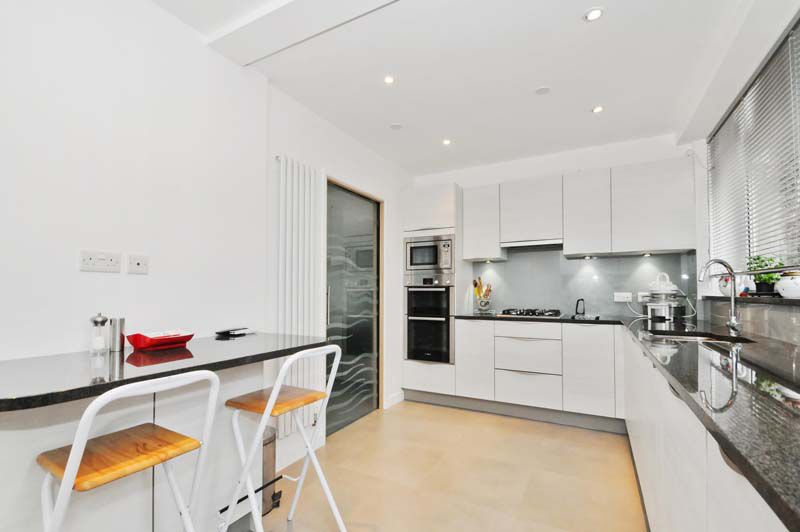 This is definitely an elegant kitchen and a working area is within, and that is definitely a plus! Here’s a good way to design your home. 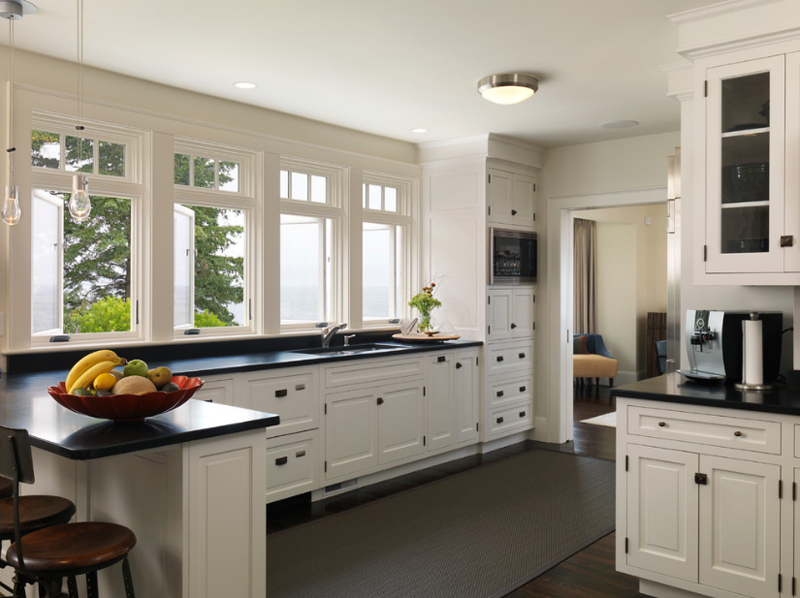 Maximize a wide space to accommodate both the kitchen and the dining area. The kitchen and sink area are white and those handle-less drawers look really neat. I also find that long counter table charming. It’s quite interesting to see the colors white, black, and purple in a whole kitchen ensemble but let us take time to appreciate the beautiful ovens in this area. Maybe some decor would also add a more “kitchen feel” to this room. 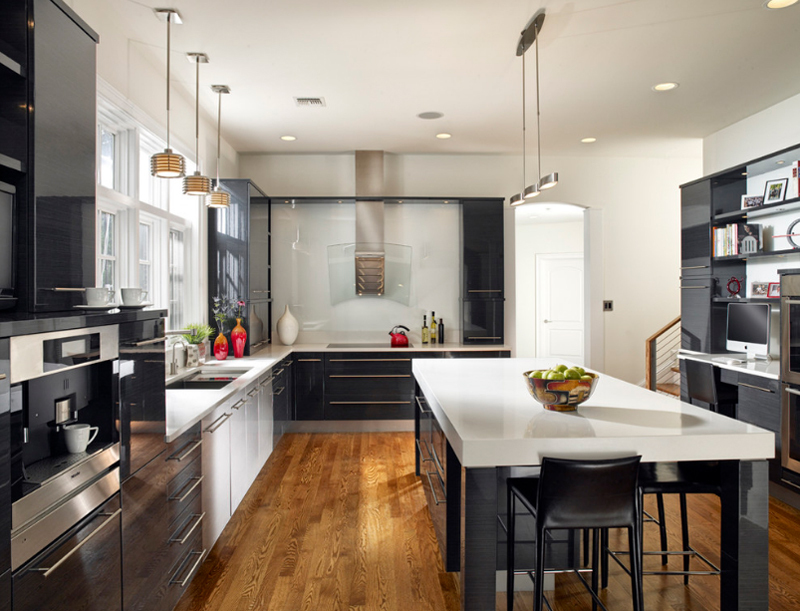 This a very modern looking kitchen and the black and white colors are in bulk which create a very classy but straightforward look and vibe to the whole area. The wooden tabletop beside the counter is practical but also gives a nice break to the black and white. The lamps in here are just fabulous! They look both industrial and vintage at the same time and its color is quite inviting. I even think that using this color, the black and white became more subtle but still pretty. I even would like to think that the lamps are the center of attraction in this kitchen. This kitchen looks like something that isn’t being used or wasn’t even used – even once. I mean, this photo was most likely taken before the house was even used by the home owners. I like the granite tabletop we see in the middle of the room though – plus the lights too! 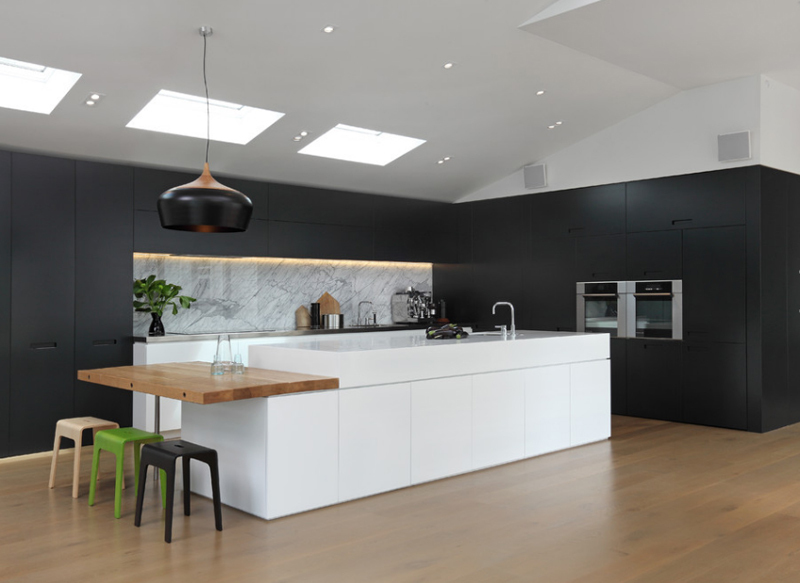 The glossy finish of the white cabinets and the matte finish of the black cabinets, drawers and walling is pretty neat. The combination is really simple but you know how much they look great together. I wish that we can see a beautiful bar stools or chairs that will look fascinating on the small nook by the wall. Hints of blue (or is it turquoise?) is seen on the walls but we see that the evident colors are black, white and grey. I like how the cabinets and drawers are a combination of grey and white and all these are complemented with the wooden flooring that surely looks Earthy and fresh! I love white because it makes spaces wider and pretty much larger than it actually is. 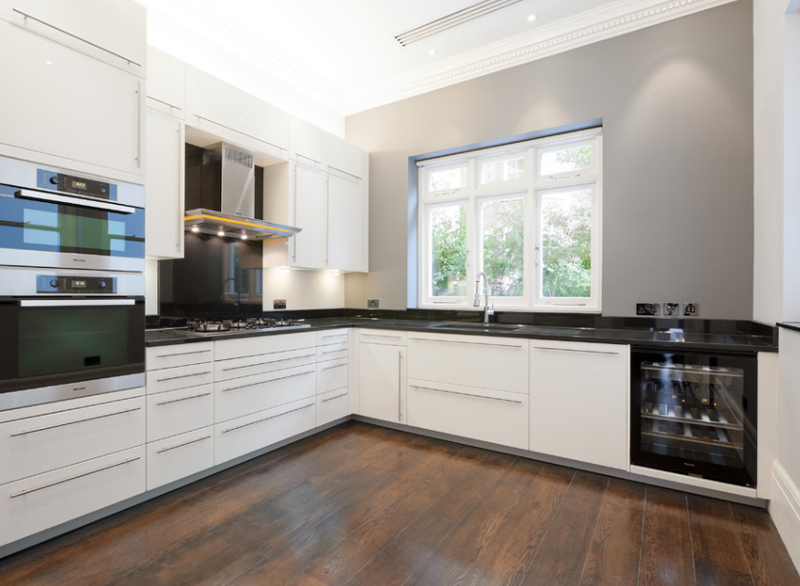 In this kitchen in Balfour Avenue, we see a rather beautiful and sophisticated-looking kitchen. The black and white combo (notice how the chairs were even chosen and arranged), makes this space real sweet. 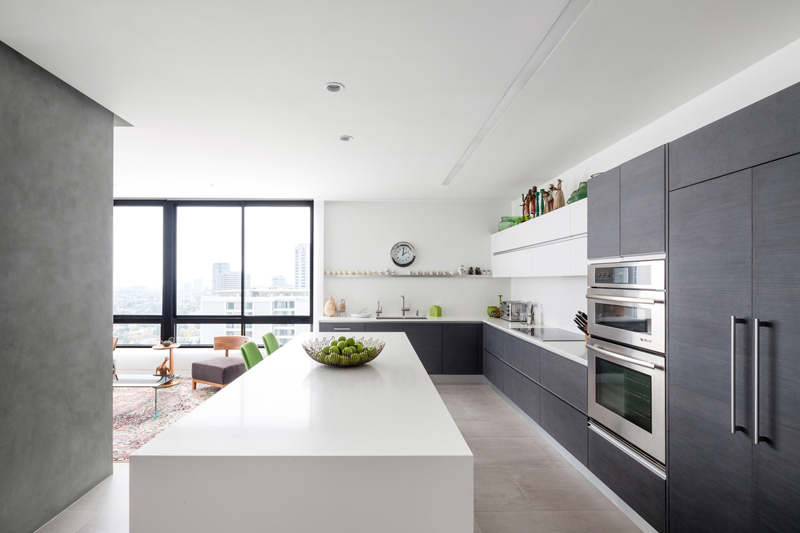 Now this New York kitchen is more on the black side than the white one if you may have noticed. 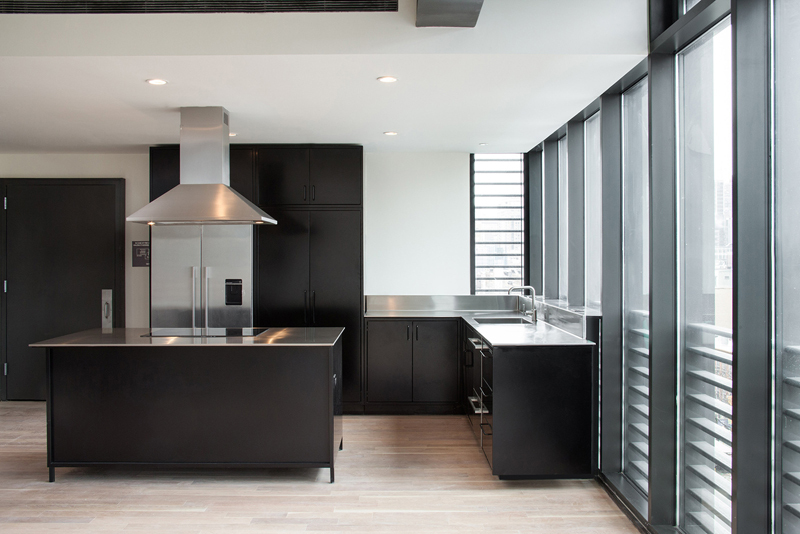 The black is evident because of the cabinets and the kitchen island and well, it’s pretty obvious that the white parts are the walls and the ceiling. I like this combo because it looks sleek and modern. 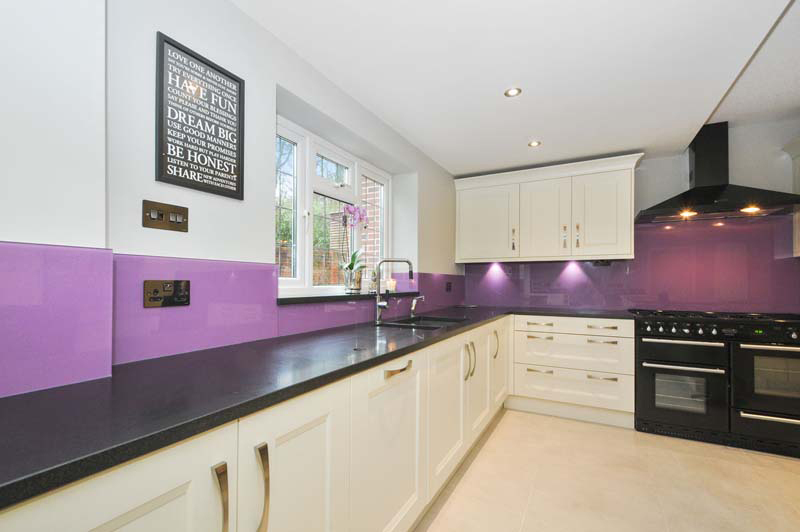 This kitchen located in a home in Glenfield Road sure has a lovely kitchen. The cabinets below the countertop and the ones above it too have these sleek lines which makes it really look modern; wooden cabinets are really pretty, but seeing this material that they used for cabinets in this kitchen is just fancy and doesn’t look high maintenance or something. If you ask me, I think this is one lovely kitchen. The cabinet work is simple but really classy, the color choice is very much sophisticated – it somehow feels clean, but not too clean. The walking space is just enough to allow people to walk around and maybe run around one bit. I feel that this kitchen needs more things – maybe more decorations or even furniture. The space in the middle of this kitchen could really use a small island or maybe a cute dining room set to occupy the vacant space in here. 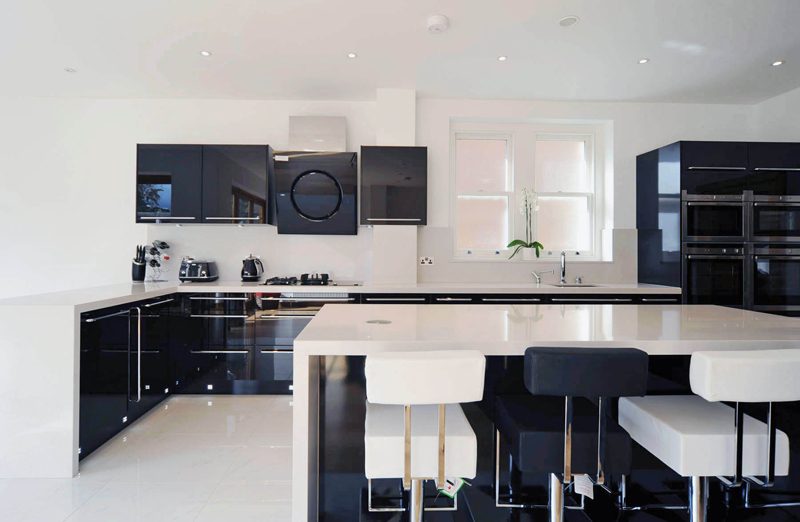 The final photo in this list is one classic black and white kitchen that has one of the cleanest cabinet work there – I think that’s taking it too far because, truth be told, every kitchen in here has photos taken even before the spaces were used; am I right? 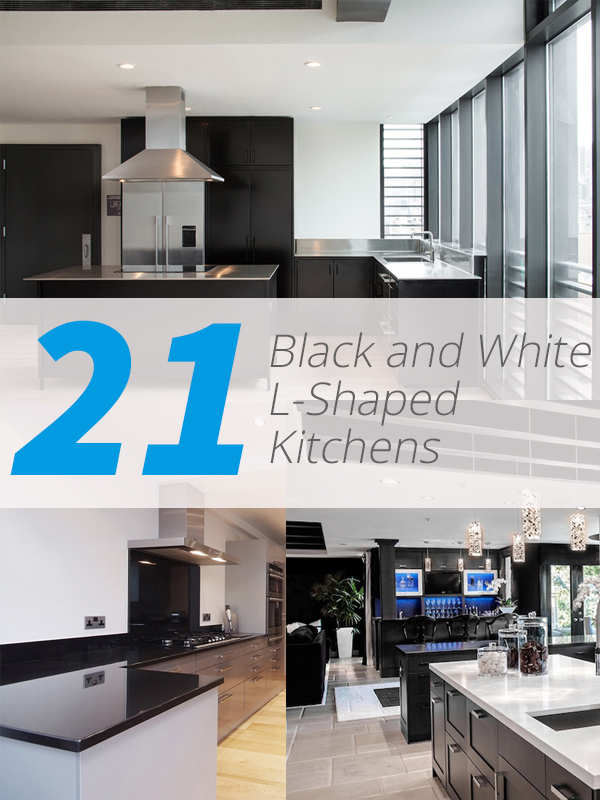 There you have it guys, the 21 Neat Black and White L-Shaped Kitchens which practically a by-product of the list I made before about Astonishing Contemporary L-Shaped Kitchen Layouts. I sure hope that these lists along with the other lists here in Home Design Lover help you in one or more design endeavors you have!